Winfield, Ala. – Tractor pulls, live music, a Civil War reenactment and a parade are all on the agenda when the town of Winfield, Ala. celebrates its agricultural heritage with a two-day event centered on mules and their role in rural farming. Set for September 22-23, 2017, Mule Day offers a variety of activities and free family fun attracting approximately 25,000 visitors from across the Southeast to the small community located 30 miles east of the Alabama/Mississippi state line. The fun begins on Friday evening at 6 p.m. when shoppers are invited to shop with local merchants during the Mule Night Madness and runners can take part in a midnight 5K run. On Saturday, the festivities get underway at 7 a.m. Tractor pulls are slated for 10 a.m. and 1 p.m., and throughout the day, antique cars and bikes will be on display in the grove at Winfield Middle School. Not to be missed at 11 a.m. is the highlight of the annual event - the parade through downtown where the honorees consist of mules, horses, jacks, and jennies. As festivalgoers wander through the town, flea market vendors will be selling their wares, and there will be clogging, line dancing and live music on Friday evening and all day Saturday. Arts and crafts vendors will be located on Ashwood Drive behind Bama Off-Road and in the Winfield Church of Christ parking lots. History buffs particularly enjoy the Civil War reenactment and living history held in conjunction with Mule Day. 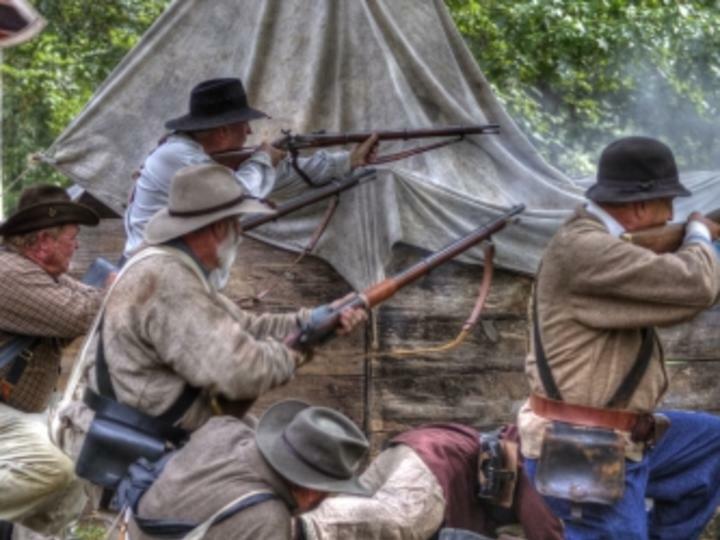 Held at the Winfield City Park, the Skirmish at the Luxapalilla includes hands-on living history presentations, authentic encampments, and demonstrations from artillery, cavalry, and infantry. Battles will take place on Saturday and Sunday at 2 p.m. The public is also invited to a Civil War Period Ball set for 7 p.m. on Saturday. Admission is free. Shuttle service, sponsored by Winfield Church of Christ, will be offered on Saturday only. For more information, visit www.winfieldcity.org or call the Winfield Chamber of Commerce at 205.487.3002.